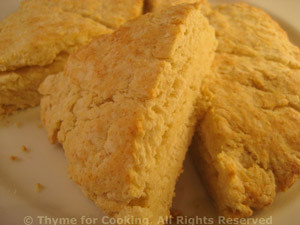 Garlic Scone, savory hot scone from Thyme for Cooking. These are delicious warm, but, like many biscuits, barely edible the next day. This is actually half of my original recipe, but it's perfect for two. Double it and make two scones if you want more. This is not going to look like nice bread dough before baking, but it manages to come together in the oven - magic! Cut in butter with pastry cutter or fork until it looks like 'crumbs'. Add milk and stir until sort of combined. Dump the whole floury mess onto a non-stick baking sheet and pat it into a 3/4 inch (2cm) thick round with your hands - but don't handle it a lot. If possible, knead it once or twice then just pat and push into shape. It will be 5 - 6 inches in diameter. With a long knife carefully divide it into 6ths, cutting about 1/2 way through. Bake at 450F (230C) for 12 - 14 minutes, until lightly browned. Remove, cut along scored lines and serve, warm with butter.